Ferrari are favourites to win the Formula 1 world title as the new season starts in Australia this weekend, says three-time champion Lewis Hamilton. Hamilton's Mercedes team have dominated for the past three seasons but pre-season testing suggested Ferrari have bounced back from a winless 2016. "I see Ferrari being quickest," he said. "They are definitely favourites." But Ferrari's Sebastian Vettel said Mercedes were the team to beat, adding: "We are doing our best to catch up." Will changes make F1 better? Quiz: Formula 1 driver or movie bad guy? The new cars that will race at Melbourne's Albert Park and for the rest of the season will be considerably quicker than last year's after major rule changes aimed at making them faster and more demanding. But Vettel said that made no difference to Mercedes' position after three dominant seasons, since the introduction of turbo-hybrid engines in 2014, in which Hamilton won two titles and Nico Rosberg the other. Vettel said: "Mercedes have been very strong and even if you change the rules if a team is strong they will build a strong car. "Looking at the performance of the cars, it was expected to be a big step up. And that's what we all said when we got out for the first time. "I think they will be the fastest cars we have ever driven. it is nice to have that. Competitiveness? We are all here to find out." The season starts without the reigning champion on the track for the first time since 1994, when Alain Prost retired after winning his fourth title. Following Rosberg's retirement, Finn Valtteri Bottas will partner Hamilton. Hamilton, 32, said: "It doesn't make any difference to me. Every year is a brand new challenge. You just want to beat whoever it is you're up against and the bigger the fight the more satisfying it is. "I have never seen the fans as excited [as they are] about this year, not knowing where the cars and teams are. More of these changes would be welcome. Maybe they should shorten the time between rule changes." Hamilton said he would relish a fight for the title with Vettel, who won four consecutive championships with Red Bull from 2010-13. And the Briton added he would like to see old rival Fernando Alonso back in a competitive car, which seems a forlorn hope given a dire pre-season for the 35-year-old Spaniard's McLaren-Honda team. 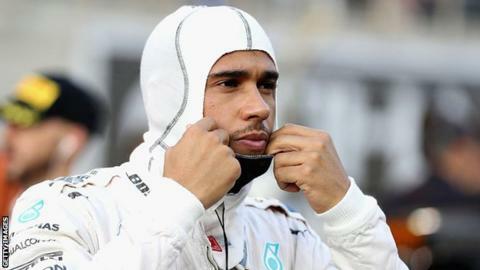 "I have not had a lot of battles with Sebastian on track, and I would love that and the fans would too," Hamilton said. "And we need this guy [Alonso] to have a good car so he can get up there and fight with us as well - before his time is up. I feel we're yet to see the best of Fernando. The sport needs that and he deserves to be able to show that. You want to be racing against the best. That's what the fans want to see." Hamilton added he was also wary of the threat from Red Bull drivers Daniel Ricciardo, 27, and 19-year-old Max Verstappen. "I am very keen to see what Red Bull bring because they were quite far behind in testing compared to Ferrari," Hamilton said. "I didn't see many upgrades and I am excited to see what they bring here." Quiz: F1 driver or movie bad guy? Read more on Quiz: Formula 1 driver or movie bad guy? Read more on Australian Grand Prix: Formula 1 returns, but will changes make it be better?